Back in the early 1990’s I met Rick Whorwood from Stoney Creek, Ontario. 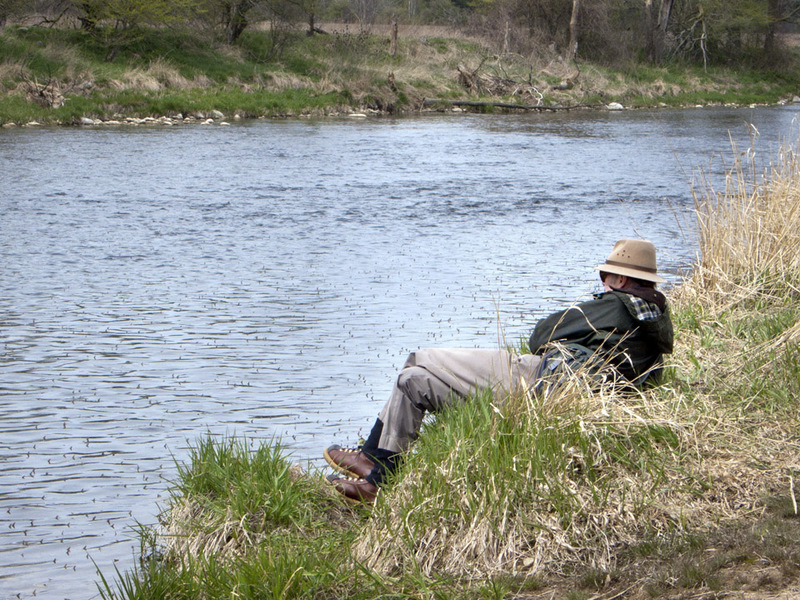 He introduced me to the Grand River, a tail-water brown trout fishery that begins at Shand Dam near the town of Fergus. It flows quite a distance into Lake Erie. I wrote the article titled, Ontario’s Grand River, that was published in Fly Fisherman Magazine (my very first published piece). This piece introduced the Grand to the world in 1995. It was a relatively new fishery because Shand Dam, originally built in the 1940’s, was retrofitted for hydro power conversion in 1989. That is when it all started. Cold water releases from the dam created sustainable conditions for trout in a river that formerly held only bass, carp, and a few pike. Trout Unlimited and Izaak Walton Club members starting a program of stocking fingerlings of a Ganaraska River brown trout strain. It is an understatement to say these fish did very well. The combination of the cold and extremely fertile water conditions has created a wonderful brown trout fishery. Well, a friend, blog follower, and occasional commenter here, John Hoffman, of Fergus, sent these photos to me this evening. I had to post them. With his permission, they are his photos. See why? Opening Day in Ontario – April 28th, 2012. The Grand River, near Fergus. John views a massive flotilla of Hendrickson duns drifting on the surface. He’s wondering why the trout aren’t rising. 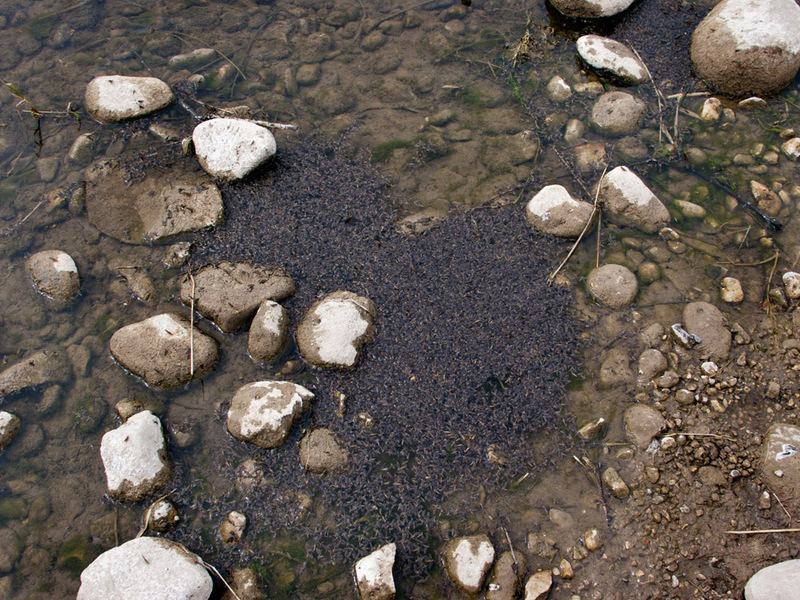 A solid mat of Hendrickson duns on the Grand River – unfortunately dead and dying. These are not cripples or stillborn duns. Mother Nature can be quite cruel, so She was this day. The cold air temperatures prevented many of the duns from leaving the water. John said this was one of the smaller masses of flies he saw that day. I need to get back to the Grand. I have not fished it for nine or ten years. I’d have to convert my old slides to digital images, but I can tell you, if I look I might be able to find photographic evidence of the most incredible and amazing 45 minutes of trout fishing I ever had in my life! It was here on the Grand River. I’ll expand the tale when / if I find the pictures. Suffice it to say the short version is I caught two sets of twins, in this order, 19″, 23″, 23″ and 19″, four brown trout. Even more amazing is that the first two were caught on a LaFontaine Sparkle Caddis Dry (it was actually one of his underwater pupa patterns dressed to float), on back-to-back casts, and after a half hour period of nothing, the second set of twins, was again taken on two back-to-back casts, on a Caddis Bead Head Larva nymph. I was with Dave Whalley, it was a Sunday morning before I was presenting a program at the Grand River Conservation Authority Annual Event that afternoon, and we had less than a couple hours to fish. And oh, I caught these four trout above the upper bridge, in the unregulated section of the river where it is not Catch-and-Release. What a day that was! Er, I mean an hour. I gotta find those photos. This entry was posted in Fish Stories and Other Tales and tagged Hendrickson, Ontario's Grand River, Rick Whorwood. Thanks for your comment on the Hendrickson hatch. In my years of fishing the Grand River I’d never seen this many bugs. I’m glad you enjoyed the photos and thank you for your enjoyment of my blog! I appreciate it very much! Don, excellent write up. I just came across your blog from Brian at Relax the Cast. I look forward to reading more. Thanks so much for your comment and for stopping by! There’s quite a bit here to read, almost 180 posts going back two years, and I am in a process of expanding the topics. Glad you liked the Grand River Hendrickson post! Thanks again! I’m glad you found me as well. 🙂 Thank you for your comment! I appreciate your enjoyment of this post, hopefully you’ll find some other topics that you can sink your vicarious trout fishing teeth into. 😉 I hope that I’m able to continue feeding your “need for an occasional trout fix.” If it’s any consolation, if you ever get “East” to Pennsylvania, I’d be happy to hook up with you for some ‘real” trout fishing. Just let me know. Cheers, and thanks again! Aye! Will do. I don’t travel nearly as much as I would like to, but there are several PA streams for which my lustful trout fishing eye has longed – Ahhh, these many years. Who knows .. I may be contacting you in the near future to put those longings to rest .. or better yet, to test and tenure. 🙂 Looking forward to reading more. Stywe lyne!! Sure thing, just let me know if a PA visit is in the offing. I might assume some of the streams on your list are not far from where I live…have a great season!